For our learning together session this Sunday Vance plans to be available to people in the Multiliteracies (or any other) EVO Session) to discuss any aspect of the event and what we and especially you are trying to accomplish here. Vance can be available from about 11:00 GMT to 14:00 GMT. and will definitely be online from noon to 14:00 GMT (Sunday habit, normal time). If you would like to join online then we can start at http://tappedin.org and move to Elluminate at http://tinyurl.com/y3eh. 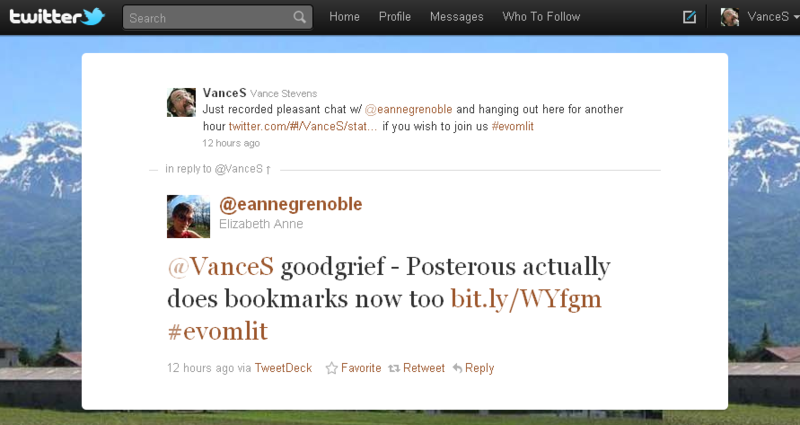 Or contact Vance on Skype or Google, ID = vancestev. Vance will guide you. Technology for teaching and learning fascinates me, and I’m excited about finding ways to use tools in ways that improve on what I’m already doing in class. Since it takes me time to learn how to use a new tool, and I teach in fairly low-tech environments, I focus on simple-to-use tools that I can use even without an Internet connection. Even though the examples I’ll be showing are geared toward teaching young learners and teens, I use the same techniques and activities with my adult learners. I hope you’ll find something that will prove useful for your own unique teaching situation, too! this will give you a better idea of what she has managed to achieve with her learners. 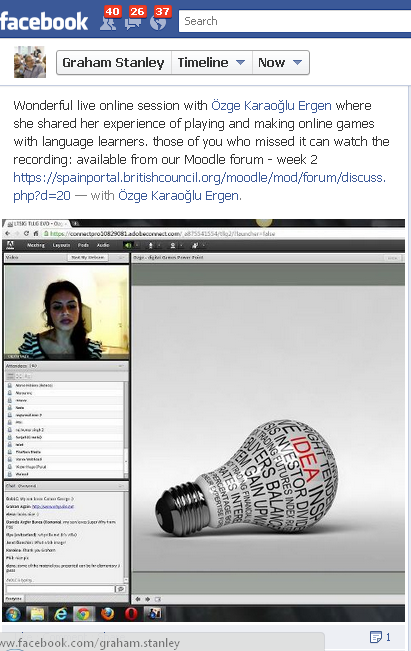 The Multiliteracies course is structured on a MOOC model with self-assessment done by MePortfolio. As a mini-MOOC it is very much participant driven, therefore the syllabus is suggested but not followed scrupulously. Vance and Kalyan will talk about the evolution of the course, including what direction we think it might take this January and February. The event tonight is a test run for the EVO kickoff next week, hosted by Jeff Lebow. 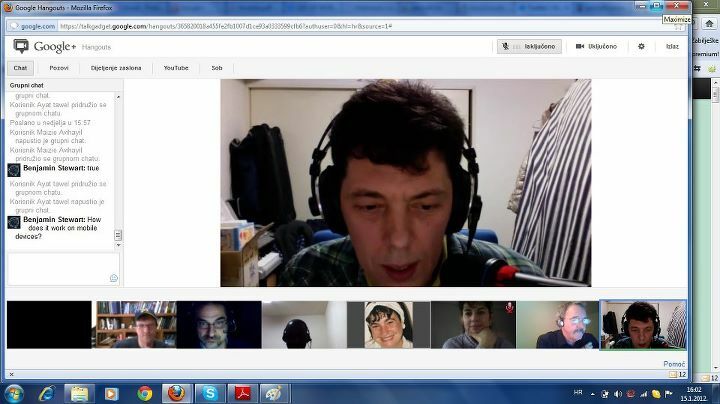 Alternatively you can participate in the live Google+ Hangout – How? 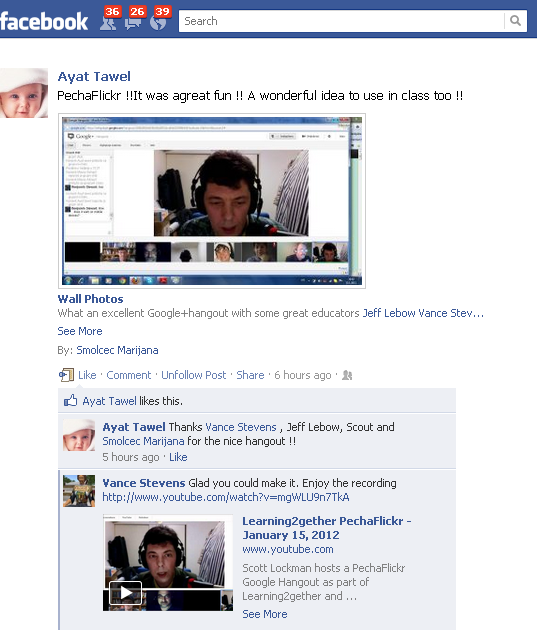 If Jeff is in your circles, when you go to Google+ you will see that one of your friends (Jeff) is hanging out, and you can join us that way. 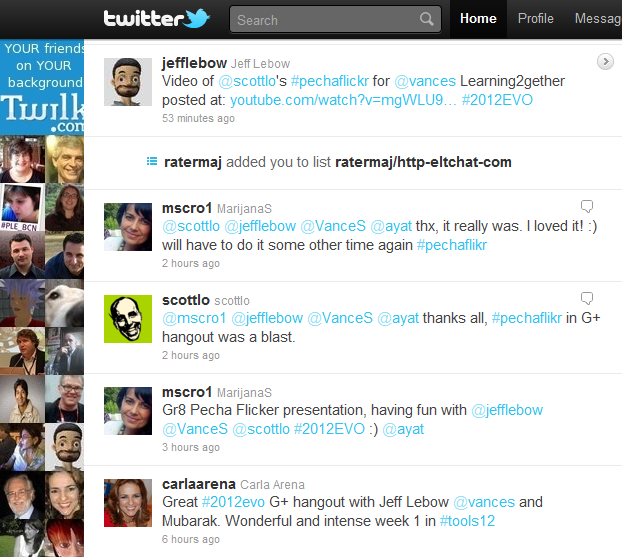 Jeff will also give us a URL for the Hangout that should work for anyone else with a Google ID.